Tony LaRussa has been a major league manager for over 20 years in the American and National Leagues, with the Oakland A’s, the Chicago White Sox, and the St. Louis Cardinals. In 1983, he guided Chicago to the American League West title. He was rewarded with Manager of the Year accolades from the Sporting News, the Associated Press and the Baseball Writer’s Association of America. He again earned Manager of the Year honors from the BBWAA and the Sporting News for three straight years, 1988-1990. In 1989, LaRussa guided the Athletics to their fourth World Championship, and on July 14, 1991, he became the 40th manager in major league history to win 1,000 career games. He earned a third Manager of the Year Award in 1992 after steering the A’s to their fourth American League West title in five years. He is Oakland’s all-time leader in games managed (1,471) and victories (798). In his first National League season, LaRussa guided the Cardinals to the 1996 Central Division title and was named Major League Manager of the Year by the Associated Press, an honor that he also received in 2002. 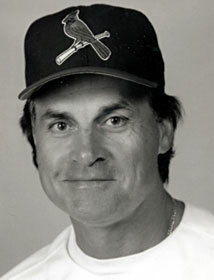 Tony LaRussa was elected into the National Italian American Sports Hall of Fame in 1998.